If you fall under either umbrella, remember this: While old-school salespeople are working the phones, rubbing elbows on the golf course, and reciting canned pitches at trade shows, at least 4 out of 5 of their potential customers are online, doing their homework on you -- and your competitors. So why not meet them where they spend the most time? Let’s talk about how attracting and nurturing leads, plus the exchange of valuable contact info through forms, helps your website reach big-boy status. If there was some letter before “A” in the alphabet, visibility through SEO would belong there. Before a lead can be born, they need to know you exist. If you’re reading this, chances are a good chunk of those 80-plus% researching online have no idea who you are -- yet. You need to ask yourself this: “If I needed my company’s services/products, what words would would I type into a Google search to find them?” Write those terms down. They will become the seeds you plant on your website. Many leads are born these days by answering customers’ questions and writing about what they want to learn about. Not everyone is instantly ready to buy -- especially in manufacturing and B2B sales. Successful manufacturing websites get people to your website BEFORE they're ready to buy. Give them reasons to visit, then guide them through that buying process -- with educational content! Make sure a call-to-action is at the end of the content (in clickable button or graphic form). This CTA provides nexts steps for the customer -- usually a gated content offer. Anything other high-value form of content you can think of! These take a little more effort on your part, and need to be especially educational content that a customer would be willing to fork over their email for in exchange. A note on forms: Remember that the longer and more privacy-invading a form is, the less likely a visitor is to convert. The value of the content should match the amount of info you’re requesting. In short, it’s only OK to ask for lots of personal details (like a phone number) if it’s a decision stage offer with high value. Another way to bring newborn leads into the world is with a pillar page. Never heard of one? You’re not alone. A pillar page connects a bunch of info about a specific topic together into one really long webpage. These long-form pieces (commonly 10x the scope of a blog) look like this example about manufacturer brand awareness. Note the CTA button at the top. Prospects may love the exhaustive resource you’ve provided, but not have time to read it. 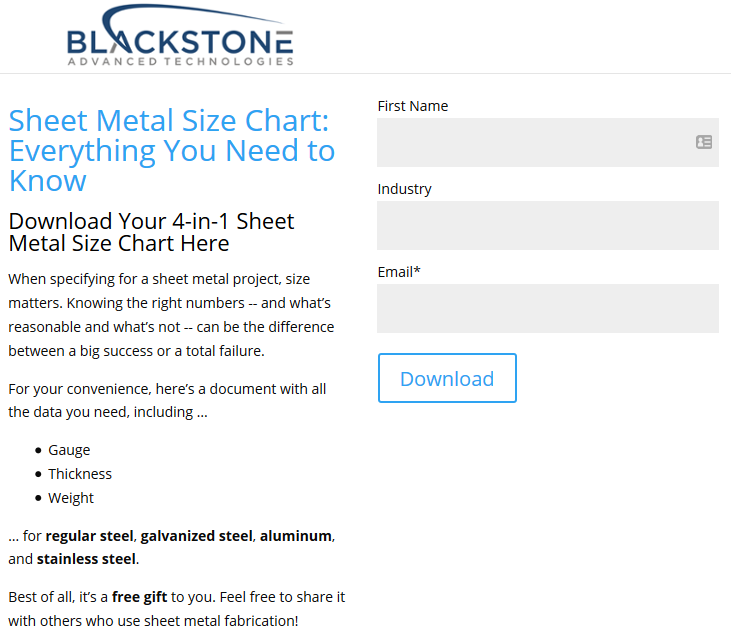 So you can conveniently offer it as a PDF download so they can read it as needed -- and you conventionally get their email address in exchange by having them fill out a form. The best and easiest customers to convert are the ones that already exist! So why not turn them into leads again? Prolific lead moms and dads continue the conversation and education via email blasts that can turn current customers into leads again. These emails contain further blog and video education, a CTA to a premium offer they haven’t seen before, etc. For example, maybe you have new service or even an existing one they weren’t aware of during their previous buying experience. Tell them about it! Historically, most manufacturers and B2Bs have relied on their Contact Us and RFQ forms to get leads online. Those need to exist, sure, but they’re not enough in today’s competitive online scene. You know those little windows that pop up or drift to the center of their screen once you scroll past a certain point on the page or hover over the “x” to close a browser tab? Those are lead flows. When they’re irrelevant and sales-y, users get angry and dismiss them to the depths of internet hell. But when they’re offering education and relevant info, they can generate leads much like a CTA does. If you use HubSpot to create your lead flows, you can take advantage of the built-in mini-form that lets you capture someone's email address in exchange for the offer. Lead-generating masters have accounts on all social media sites relevant to their buyers. Yes, even manufacturers with “nothing exciting to talk about” should be on social media. These masters distribute great self-published content and other third-party resources you think your prospect will find useful. When possible, tag people and companies you mention to get them to notice it. Great online marketers also put their lead-nurturing skills to use in LinkedIn Groups and Facebook Groups. These are great places to show off your industry knowledge and look like the company to work with. It’s not enough to bring a baby into the world. You’ve got to guide its growth. Same with leads -- you can’t forget about what should happen once your visitor converts on an offer. Button submissions should send the lead’s contact info into your customer relationship management (CRM) system. (Parenting pro tip: HubSpot does this automatically.) Make sure an email notification also goes out to either your sales team or marketing team, depending on which stage of the buyer’s journey your offer targets. On the prospects’ side, send them to a thank-you page that gives them the link to the offer download. We’re also fond of the idea of offering more content on this page as a next step in their journey. This content could be blog posts or another premium offer. Finally, the proud pop should send an email to the leads, thanking them for downloading and offering a link to the offer for safe keeping. Just like with thank-you pages, you can use this opportunity to offer more valuable content to keep your company at the top of their minds. 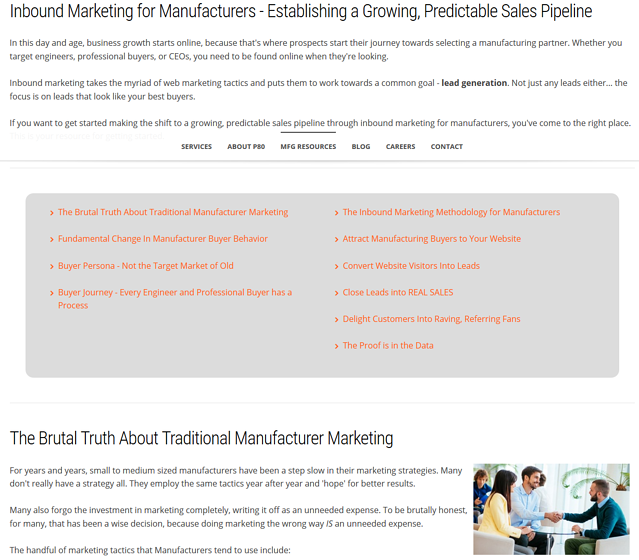 HubSpot (or Wordpress with plug-ins) is your best bet for connecting this huge web of ways to capture manufacturing leads. Once you’re up and running, don’t forget to review your work! Testing and analysis can help you decide whether that lead flow should slide onto the page or pop up, whether one style of email subject line results in more opens than another, etc. Just like that, you’ve not only brought a manufacturing lead into the world, you’ve also raised it to be a fully grown customer someday!